This is where you can find out where to rent Yurts in Cumbria. 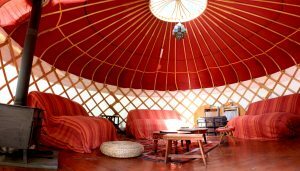 Whether you are looking for an Eco-friendly Yurt or a luxurious Glamping Experience - or perhaps a combination of the two? We are sure that you are going to fall in love with at least one of these Yurts for your next Lake District holiday. Have fun choosing! These beautiful Yurts are built to stand all the British weather can throw at them. They 16ft in diameter and tall enough for you to walk upright inside and are pet friendly, (though please contact Simon in advance to arrange). 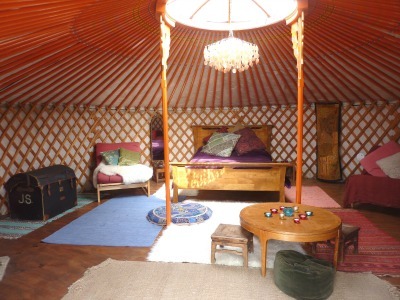 Equipped with wood-burning stoves, wooden floors and scatter rugs it is no wonder these yurts getting glowing reviews. The Yurts are pitched in a fabulous rural setting. A friendly farm campsite, which is next to a small stream close to the rural village of Seatoller at the head of the Borrowdale Valley. Each Inside-Out Yurt has a wooden floor and is well furnished and sleeps up to 4 adults (fifth person can be accommodated on air-bed). Note : there is currently no mobile signal at Seatoller or electricity for campers. You can check even more information on Inside Out Yurts including prices and booking enquires here. Set amongst 20 acres of natural woodland and just a 10 minute walk to the shores of Windermere in the heart of the Lakes. 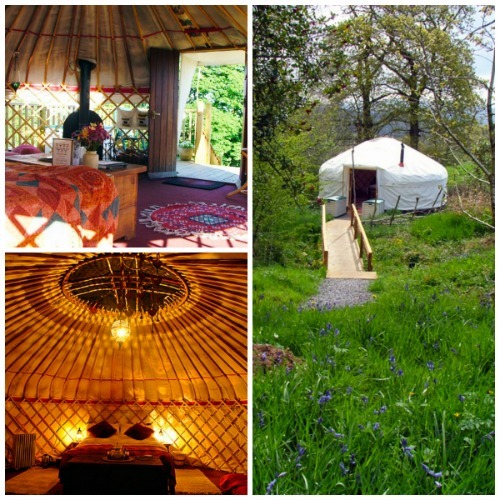 Located at the southern end of the lake at Windermere the woodland makes an ideal setting for these three Yurts. In spring time the daffodils and bluebells add carpets of colour and in the winter the wood affords spectacular views over Windermere lake. The yurts nestle in secluded clearings with plenty of open space and stunning views over Lake Windermere and beyond. The site is a private woodland rather than a traditional campsite and therefore enjoys a high level of freedom and privacy. The stream fed hot water shower comes with this incredible view! and is for the sole use of guests at the yurts. 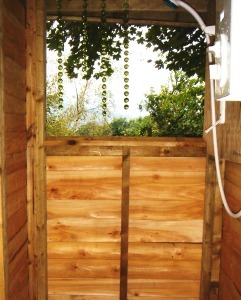 Additional toilet/wash facilities are just a couple of minute's walk from the yurts. There is a fresh water tap in the woodlands for those mundane tasks like washing up, in addition to ten litres of drinking water in each yurt. A proper Double bed plus either single or futon beds with bedding included. Kitchen area with fridge, crockery, cutlery, kettle, pots and pans etc. 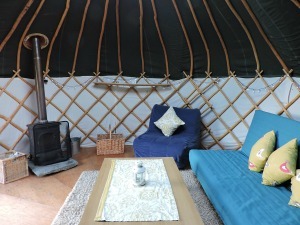 The Yurt's bigger diameter allows plenty of room to relax by the wood-burning stove on those cooler evenings. Outside the Yurt you will find a fire pit and BBQ in addition to tree lanterns. More detailed information can be found on the Lovely Yurt Company website. Made from local sustainable wood and designed to blend with its natural surroundings 'Crogin' is by the river in the pretty Eden Valley, perfect for watching fish jump, owls swoop and maybe, just maybe spotting the elusive otter? Furnished with a good comfy bed and warm snuggly duvet the yurt has been designed to blend in with its surroundings, whilst providing you with the comforts not normally found with outdoor life, such as a wood-burner for those chilly evenings and a well equipped dedicated outdoor kitchen. The loos and shower are eco-friendly and designed for minimum impact on the local environment - they will even supply you with eco-friendly shampoo! One of the facilities which really makes Drybeck stand out from the crowd are the provision of a dedicated cookhouse for each accommodation. These include an electric supply, running water, an oven with hob, and a fridge plus all the utensils and crockery that you will need. We also love that each cookhouse has its own decking with table and chairs. 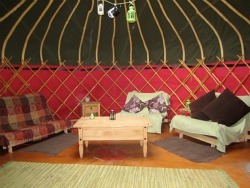 Check prices and availability of Drybeck Farm Yurts. For a truly romantic or extra special family holiday head why not head over to the Wasdale Valley? 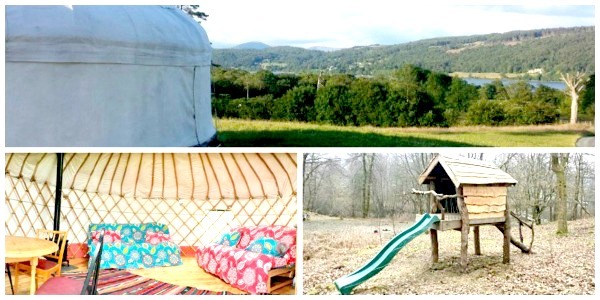 Set amongst stunning Lakeland scenery you will find two beautifully furnished 18ft Yurts. Made in the UK from native Ash each yurt has a wood-burning stove to keep you cosy on cooler evenings. In the morning soak up the view and potter over to the farmhouse for one of John and Debbie's fabulous Full English or vegetarian breakfasts. Each Yurt sleep up to five, with a double bed and three single shiatsu mattresses. Both Yurts are beautifully furnished and beds will be made up for your arrival using crisp white cotton bed sheets and colourful throws. Your own toilet and shower facilities are located close by; please bring your own toiletries and towels. Other facilities include picnic table and chairs along with a BBQ, electricity and constant hot water for teas and coffee. Should the weather be variable then you may appreciate the nearby utility room with its washer/dryer and sheila maid drying rack. There is also free WiFi with the best signal being from the breakfast room. Read testimonials from previous guests and find out more about Rainor's Farm here. 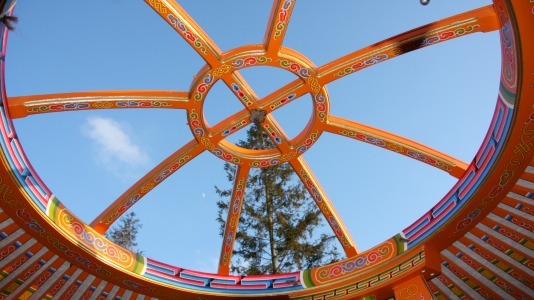 These traditional Mongolian Yurts are perfect for experiencing the magic of sustainable tourism in Cumbria. 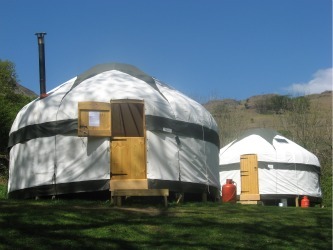 Their location, at Rydal, is in the heart of the English Lake District, making the Yurts perfect for an eco-visit to the area. You can get to within 400m of the Yurts by public transport and be rewarded with a 10% discount for your efforts! A proper double bed and two singles including fresh linen. 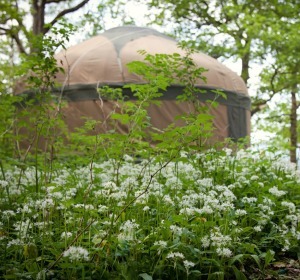 (an additional two guests can be accommodated in each yurt, please bring your own bedding mat and bedding. Free Solar/Hydro Hot Showers and Clean Toilets are available very nearby with underfloor heating! Please note that the yurts are located at the top of the Camping field and other tents cannot be located near your Yurt as they are restricted to set pitches. There is a steep walk up to the yurts so please pack sensibly with this in mind. You cannot drive your car directly to the yurt. 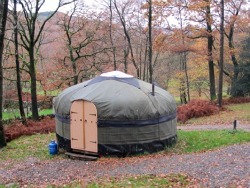 You can read more about these eco friendly lake district yurts right here. Long Valley Yurts offer the perfect combination of back-to-nature living, without compromising on all the usual luxuries you would wish for on your holiday. 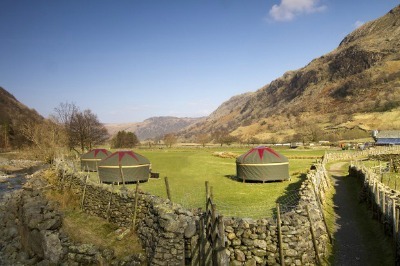 Long Valley Yurts are available at these three stunning locations in Cumbria. They offer a wide range of outdoor activities (please book in advance) from bushcraft to rock climbing, abseiling or a canoe on the lake. Of course you could just walk from the door, or snuggle up by the wood burning stove with a traditional board game from the games chest. Furnished in a distinctly Moroccan style with raised wooden floors and colourful rugs, futon beds, warm duvets, cosy wood burning stoves, solar lighting and fairy lights it is not surprising that guests reviews describe their holiday as A truly magical experience. There is a Gaz hob and grill with the Gaz included or visit one of the nearby pubs serving fantastic food. Facilities do vary between the sites, but all boast clean toilet and shower blocks. If you are travelling with children then do take a look at some of the activities you can book with Wild in Style. From making your own outdoor fire by rubbing two sticks together to ghyll scrambling or abseiling. Both locations are close to the waters edge, with Low Wray being just a few minutes walk and Hoathwaite about 10 minute walk. There are pubs restaurants and cafes you can walk to if you fancy eating out. You could also try one of the Alfresco pizzas! A 12 volt power supply runs the lighting and a wood burning stove keeps you toasty warm in the cooler months. The yurts come equipped with crockery, cutlery and for cooking you'll be amazed what you can achieve with a double gaz burner, grill and toasty machine, especially useful for warming naan breads! It is a good idea to bring a cool box as there is no fridge, but freeze packs can be refrozen in the campsite shop and naturally you'll be wanting to chill your beer in the waters of the lake? Freshly laundered linen awaits your arrival and sleeping is on futon beds which doubles as seating during the day. The campsite at Coniston now has a dog friendly yurt, but as the details of each yurt vary on the different sites you may want to check out the finer details of Yurts at Low Wray and Coniston by going to their website here. What better way to enjoy the beautiful Lake District. Their photogenic location and views of Scafell Pike and Great Gable make these three yurts a walker's and photographer's paradise. Sleeping from 2 to 5 people they are also a great base for a family holiday exploring Keswick and the northern Lakes. Locally made the yurts are furnished with a double sofa bed with luxurious goose down duvets and two single day beds which double up as seating during the day. There is also room for a camp mat if there is a fifth member of the group. A basket of logs and wood burners couple with solar lighting make the yurts cozy in the evenings and there is a cupboard of board games and maps for you to use too. The site is at the foot of Scafell Pike and the yurts are situated right next to the river but with protection for children. There are toilets, washing facilities and hot showers just a few minutes walk away in the farm buildings. 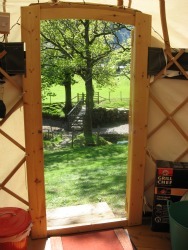 The yurts are available from March until October. For prices and availability check here.